Rolling Stones Let It Bleed Rarest Variant Pressing (London NPS-4, 1969). Most Rolling Stoners rate Let It Bleed as one of the best albums of the band's long and storied career. But the big deal with this particular copy is it's a multi-colored vinyl pressing, a very exclusive offering originally intended just for a select few execs of the London Records label. We're aware of only one other copy having ever been offered. Another oddity is that the labels are reversed; that is, the label and song list for Side 1 is on Side 2 and vice-versa! It's far and away the rarest of all US Rolling Stones albums. 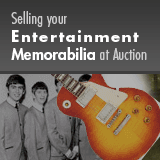 Jerry Osborne's Rockin' Records lists a value of $10,000-$12,000 for a Near Mint copy! Condition: EX 7/ EX 7.